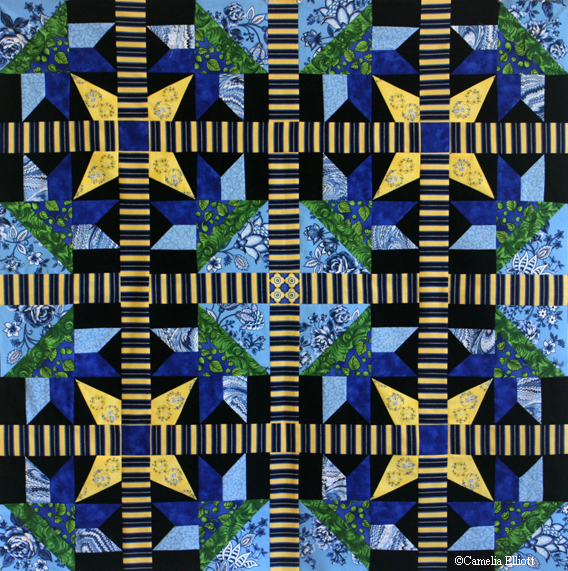 I am excited to be part of New Quilt Blogger Blog Hop at Plum and June. At the end of this post, you will find a list of other Blog Hop participants. I will start by introducing myself to everyone who does not know me. My name is Camelia Elliott and I started quilting in 1995. My love for quilting has grown into a business, “Camelia’s Unique Creations”. 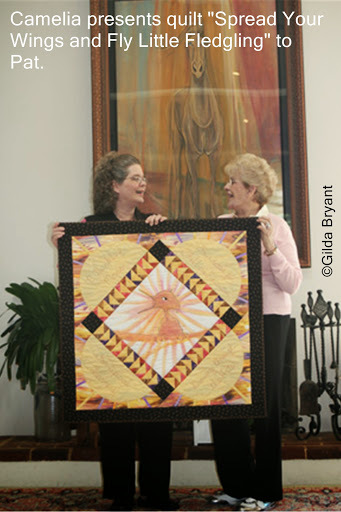 I design and publish quilt patterns, host 4 day/3 nights quilting retreats, give lectures and teach quilting class. 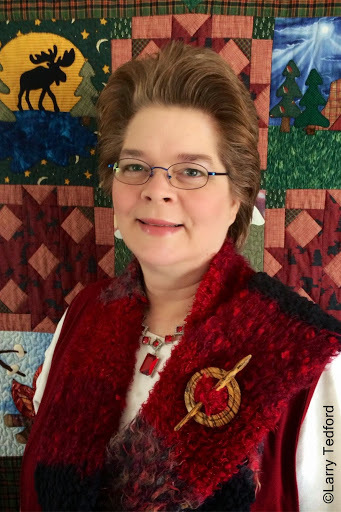 I travel across the US and teach at quilt guilds and quilt shows. My most fascinating quilted project is my quilted couch. I designed a simple block and set it in a kaleidoscope arrangement to create this stunning piece of furniture. I made a king size quilt and cut it up to reupholster my couch. For a slideshow of photos of the quilted couch in progress and to read more, click here then scroll to the bottom of the page. Quilt shop owners from miles around went crazy over my first quilted cushion. I decided to share my concept with others. When I went to my machine quilter’s house to pick up the quilt, she commented, “This looks really good on my bed.” She was right. I made the decision to publish a pattern with all bed sizes “Kaleidoscope Flower Garden”. When placing the “couch quilt” (created with blues and yellows) next to the wallhanging (created with country French fabrics in primary colors) I was amazed at the difference. One change was the layout. In the quilted couch, the starbursts are outside of the center kaleidoscope. In the wallhanging, the starburst is in the center. Both projects are created with the same simple quilt block. Isn’t the difference amazing? “Lighthouse Cottage by the Sea” was created to commemorate our 30th wedding anniversary trip to Florida. I considered creating a scrapbook, but instead designed a scrapbook quilt that resembled 35mm film strips and beach memorabilia. Working with the vivid, cheerful colors was a breath of fresh air and filled my heart with joy. This is one of my favorite quilt designs. To see all of my quilt pattern designs go to my website and click on patterns. Now I’d like to show and tell you about my charity quilts for P Buckley Moss Foundation. Since 2007, I’ve enjoyed working with Pat Moss. I have always loved children and The P. Buckley Moss Foundation promotes the integration of the arts into all educational programs, with a special focus on children who learn in different ways. Moss/Elliott raffled and auctioned quilts have brought in approximately $3,000. to the P. Buckley Moss Foundation. Click here to see all of my originally designed charity quilts as well as close up details and photos of the quilts in progress. I will share a few blogging tips, some quilting tips and a few trivial facts about myself. My blogging tip suggestions are: do not use an all white background with all words and no photos (b-o-r-i-n-g). Use a lot of photos because they help tell a story and many people are visual learners. Small photos on a blog frustrate me. I like to be able to see everything and strongly dislike small photos. 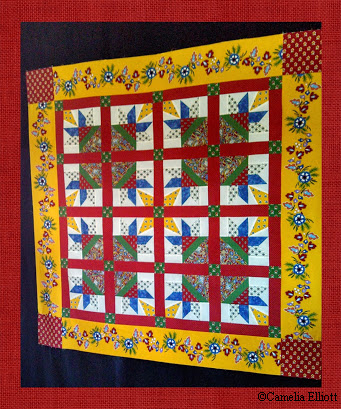 There are quilting tutorials on my blog. My favorite videos are “Demystifying Y-Seams” (April 30, 2014) and “Easy Needle Threading Video Tutorial” (April 20, 2014). Special thanks to my friend Mary Ellen of Quilt Mouse Blog for filming the videos. A few trivial facts about myself? I am a blacksmith artisan. Although blacksmithing is at the opposite end of the spectrum from quilting, forging that hunk of iron gives me satisfaction and offers another avenue to express my creativity. Because my grandfather and great grandfather were both blacksmiths, it must be in my genes. I have created: a Camellia flower business card holder (click here to see photo slideshow), yard art, a bottle tree and much more. There are more blacksmithing photos on my Facebook page “Camelia’s Unique Creations”. Trivial fact #2—I am an author. My living history book, “Nestled in the Blue Ridge Mountains” is a combination of quilting, photography, history and literary work. If you would like to read about my “quilt that grew into a book” click here. If you are interested in quilting, photography, or blacksmithing, you may enjoy my website and Facebook page “Camelia’s Unique Creations. Thank you for taking time to read my blog post! I hope you will come back sometime. This entry was posted in Blog Tour/Blog Hop and tagged Blog Hop, Blog Tour, My Favorite Quilts, New Quilt Blogger Blog Hop, Plum and June’s Blog Hop. Your couch is stunning. I love the black with the blue and yellow. The difference between the two quilts is fascinating. Jasmine, thanks for the compliment on my couch. I, too, was amazed at the difference in the quilts using the same block. I love your filmstrip quilt. Quilts are the best memory books! Love your approach to the memory quilt and your couch is fantastic – great idea! Thanks, Ruth. Glad you liked the memory quilt and my quilted couch. Hi Camelia, it is good to get to know you better! The blacksmithing is really fascinating, and I can see how it relates. Very cool. quiltingjetgirl, blacksmithing is so awesome! It’s a great diversion where I can express my creativity in a different way. I have a sea themed quilt, too, but it doesn’t look great like yours. I’ll show it when it’s my turn. Nice to meet you. Bee @ Pink Almond Quilt, Thanks for the nice compliment. I can’t wait to view your sea themed quilt! I love that couch, it is unique and beautiful and I want one!!! I’m glad you included those extra facts about yourself – how interesting!!! Thanks, Beth. I have enjoyed the blog hop. I az co pletrly amazed at the couch restoration and reformation! I have two couches I have not been fond of and want new ones…I am once again inspired to step outsidemy comfort zone and instead of giving up on the couch I am going to make it feel young again! Thanks! megan, my couch was sturdy and comfy and I didn’t want to get rid if it. They don’t make them like they used to and some of the newer couches actually have armrests made from cardboard, not wood (ugh). Find a good reupholster specialist to work with and quilt your couches! 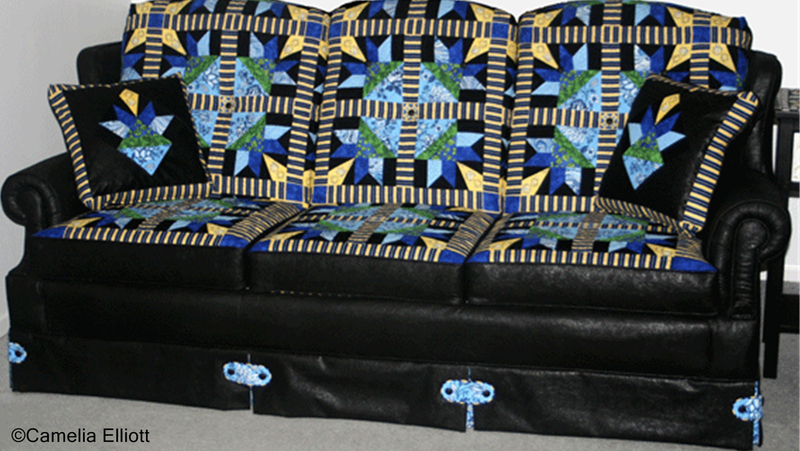 Serena @ Sewgiving, glad you like my quilted couch. I have really enjoyed it! Rebecca, thank you for your kind words. I don’t like being bored and have numerous hobbies! Nice to meet you. I love how you tackled the couch. That was so clever. Thanks, Cynthia. Nice to meet you too. Hi Liz, Go take that welding class! I have done some welding to go hand-in-hand with my blacksmithing. Wow! Your couch is lovely and amazing! Thank you for sharing. Thank you, Katie Dold. I love the end result and have really enjoyed it. Looks like you have many interests. Traveling and teaching others sounds exciting too. Vera, I do enjoy numerous hobbies and sharing the love of quilting with others. Your quilts are creative and beautiful. My favorite is the beach quilt, because I love spending time there. Do you ever teach or hold retreats in the northeast? I’m part of hop and am glad I stopped by to meet you and read your blog. Anne Beier, thanks for checking out my blog! I would be thrilled to host a retreat and teach a class in the Northeast. Maybe you could talk to the chairperson at your quilting guild and let me know if your guild or local quilt shop is interested (they should check out the quilting retreat link on my website: http://www.cameliaelliott.com). I like the scrapbook approach to your quilt! Thank you, barbarakonkle. I was pleased with the end result. I don’t think blacksmithing is necessarily the opposite end of the spectrum from quilting: both involve making tangible things and require skill and patience. Different materials and traditionally different genders, but not poles apart. It is nice to meet you too, Granny Maud’s Girl! Wow, you are a woman of many talents! I cannot believe that couch- it’s fantastic! Thanks for your nice comments, Jehnny. I can’t believe those two quilts are the same! It sure is amazing what different fabrics do to a pattern! Love the holiday scrapbook quilt too. Great idea! I was amazed too, Joanna. Great post to learn more about you! The contrast between the 2 quilts is amazing. That’s so cool that you’re also a blacksmith. Yes, you definitely have the creative genes in you! Thank you for checking out my blog, Diana @ RedDeliciousLife. Hi Camellia, I really like the idea of a scrapbook quilt, thanks for sharing! Kate Yates, I was pleased with the outcome of the scrapbook quilt. I love your lighthouse quilt! Your couch is incredible! What a leap of faith to take a quilt and cut it up! The results are stunning! Thanks, Judy. I love my quilted couch! When I read ‘quilted couch’ I thought it would be really tacky, but it’s actually beautiful. A unique creation indeed! We watched a blacksmith working a couple of summers ago and found it fascinating. Leanne Parsons, I appreciate your kind comment. Blacksmithing is quite fascinating! Thanks, Wendy. You should try your hand at blacksmithing. 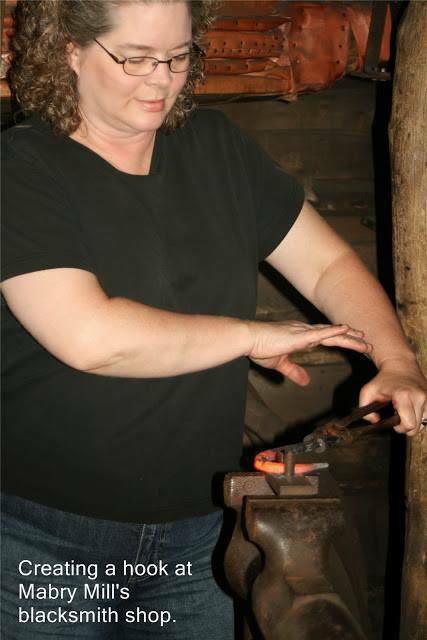 To find more info in your area, google “Blacksmith Guild” or “Blacksmith Association” plus the name of your town. That couch is unique! Love it! Thank you for commenting on my blog, Nurdan. Glad you like my quilted couch! That’s so cool that you do blacksmithing as well. I’ve been known to tile a countertop or rip apart a deck and it always makes me glad too that I have multiple avenues for creativity. Jessica, I would like to try my hand at tiling. You are my inspiration! I did help my husband build a deck one time. Thanks, Deborah. I love adding photos to quilts!